A few months ago I bought a new mobile phone cover with Abi’s photo on it. A brave move for me as it had been, and still is, hard for me to look at pictures of her. It was so well made and quickly delivered that I wrote a review of the company. The company’s director was so touched by our story that he offered to not only give me my case for free, but also pledged to help us with fundraising for Abi’s Star Tribute Fund at Bristol Children’s Hospital. 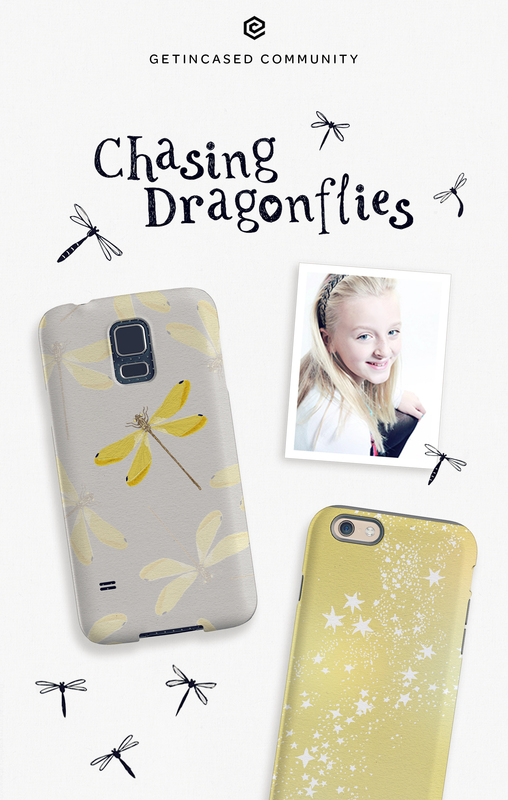 With our input, they interpreted Abi’s spirit and the essence of my blog into a new collection of mobile phone cases especially created in her memory. It’s not hard to see that they took a great deal of trouble to get these right for us and we were able to choose our favourites from a wide selection. It feels unreal to see them now online, ready to order, and profits will be put towards our Justgiving page where the money goes directly to The Grand Appeal charity for Bristol Children’s Hospital. What I love about this initiative is that the cases are beautiful as standalone pieces and so people can buy them whether they knew Abi or not, to remember a loved one or just because. The dragonfly is a popular pattern so I’m hoping lots of people choose to buy them simply because they look so stylish. Also knowing their money will go to a very worthy cause is a double benefit. Abi got her first mobile phone when she was 11; she had only just received a new phone for her 12th birthday. Like anyone her age, she loved her phone and was often asking us to buy her a new design case. So I know she’d absolutely love this! I can certainly vouch for these cases too. My Abi case looks as good as new and, as it’s the TUFF version, it has saved my phone from damage more than a few times! The cases are for iPhone 6 and Samsumg Galaxy S5 – so if you own one of these, or know anyone who has just bought a shiny new phone, please send them to Getincased.com. You can also track our progress with fundraising, or donate, by visiting http://www.justgiving.com/Kelly-Owen/ – so far, through everyone’s amazing contributions, we have raised over £25,000 for Bristol Children’s Hospital, including this web page and all other donations. Let’s keep going! This entry was posted in Fundraising, Remembering Abigail and tagged Bristol Children's Hospital, fundraiding, iphone 6, justgiving, mobile phone, Samsung Galaxy S5, the grand appeal by Chasing Dragonflies. Bookmark the permalink. Such beautiful designs. What a great idea for raising money for Abi’s Star Tribute fund. If I didn’t have a phone that’s at least 100 years old I would get one for sure. Such a lovely idea and the cases look fab. I hope lots of people order them.